Riding with Teutonic perfection, Philipp Weishaupt produced a flawless effort to win the €50,200 CSI 3* Sharjah Grand Prix presented by Longines during the first weekend of competition at Sharjah Equestrian & Racing Club. That success would have been the ideal way to prepare for the upcoming €150,000 CSI 5*-W HH Sharjah Ruler Cup at the same venue from 30 January to 2 February. Both events are part of the 19th Sharjah International Show Jumping Championship, which is being held under the directives of HH Sheikh Dr Sultan bin Mohammed Al Qassimi, member of the Supreme Council of the UAE and Ruler of Sharjah, and enjoys the patronage of HH Sheikh Sultan bin Mohammed bin Sultan Al Qassimi, the Crown Prince and Deputy Ruler of Sharjah. German rider Weishaupt is bound to start among the favourites for the prestigious title after proving a cut above the rest of the competition as he rode Catokia 2 without fault over the course in 34.6 seconds. 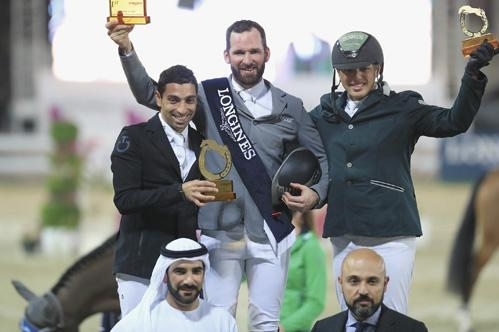 Egypt’s Abdel Said was second aboard Arpege Du Ru with a time of 40.32s, while Saudi Arabia’s Abdullah Al Sharbatly on Woulon L was third with one fault and a time of 52.75s. Fourth placed Janika Sprunger of Switzerland posted a better timing than Al Sharbatly, but was undone by her four faults from the first round. Al Sharbatly on the other hand had registered a fault in each of the rounds. UAE’s Mohammed Ghanem Al Hajri riding Doklahoma VDL placed fifth with a time of 34.55s while amassing eight faults in the process. Third in the CSI 5*-W Dubai Grand Prix a fortnight ago, Weishaupt made no mistake and turned out to be the only rider apart from Said to go faultless in the final round of the event. Al Hajri was the only rider to reach the second round of the showpiece event among the eight Emiratis that had qualified, including lady rider Nadia Abdul Aziz Taryam, who had booked her spot in the main competition after winning the €15,000 CSI 3* Longines Grand Prix 1st Qualifier with Askaria 3, whom she rode in the main event a day later on Saturday. The other qualifying event, the CSI 3* UAE Equestrian Federation Qualifier, was won by Sweden’s Evelina Tovek and Cortina 212 with a time of 68.24s. Vladimir Tuganov of Russia was second with 68.64s aboard Tulum, while Said took third after riding Chakira across the course in 69.03s. The next big event in terms of prize money was the CSI 3* Cavalor One Round & Jump Off which was won by Ramzy Al Duhami of Saudi Arabia aboard Cedan. It produced one of the toughest finishes with the top three separated by mere fractions. And while Al Duhami clocked 35.25s, second placed German rider Jorg Naeve, aboard HH Fleur, was timed at 35.52s, with third placed Saudi rider Kamal Abdullah Bahamdan clocking 35.65s on the back of Sansibar 89. Among Emirati winners at the event were Sultan Majed Al Awani, who won the CSIOJ Al Shira’aa Juniors Jump Off aboard Ajial,Moufi Owaida Al Karbi winner of the CSIOY Al Shira’aa Young Riders Jump Off with Pogba, Ali Abdalla Sultan bin Khadimwinner of the CSI 3* Sharjah Chamber of Commerce Two Phases Competition with Doxanne B and Humaid Abdulla Al Muhairiwinner of the CSIOY Al Shira’aa Young Riders Welcome Competition with Corando 11. A horse auction was held on the sidelines of the event where 21 lots were sold for a total of €369,000 (Dh1.586 million), with the highest price paid for a horse being €44,000.